Puaiohi, or Small Kaua‘i Thrush. A recent study found that are only about 500 of them left in the wild. Photo by Lucas Behnke. Mosquitos and rats can be pests for people, but they’re also very harmful to our endangered native birds. The Kaua‘i Forest Bird Recovery Project (KFBRP) is starting an end-of-the-year fundraising and outreach campaign to help the native birds on the island recover their population, according to news release from the state Department of Land and Natural Resources. Titled “Songs, Not Silence” — also known as “Restore the Symphony in the Forest” — the project aims at helping restore the birds’ chorus to full strength. Even before the arrival of people, many of Kaua‘i’s forest bird species were occupying the forests, but over time they have been threatened by mosquito-borne avian malaria and other environmental threats. Mosquito disease control and rat-trapping work is needed to help recover bird populations. KFBRP staff needs funding for helicopter flights to remote locations, interns to help with research efforts, radio transmitters to help track the birds and their activities, mist nets to help catch them for tracking, sampling and disease screenings. They need canisters with water and bags of alfalfa to help lure mosquitos for control efforts. In addition, funding is needed for research especially for the ʻAkekeʻe and Puaiohi, two critically endangered forest birds. 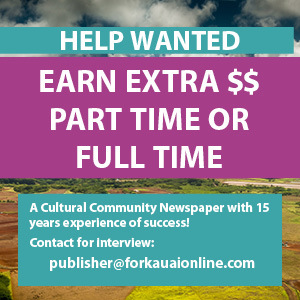 The ʻAkekeʻe exist only on Kaua‘i and only about a thousand remain. Puaiohi numbers are also down to just 500 individuals in the wild. Mosquitos and rats have contributed to their dwindling populations. You can also donate at www.kauaiforestbirds.org or send a check made out to Garden Island Resource Conservation and Development, Inc (GIRCD) and mail to KFBRP, PO Box 27, Hanapepe HI, 96716. Visit the Kaua‘i Forest Bird Recovery Project for more information.